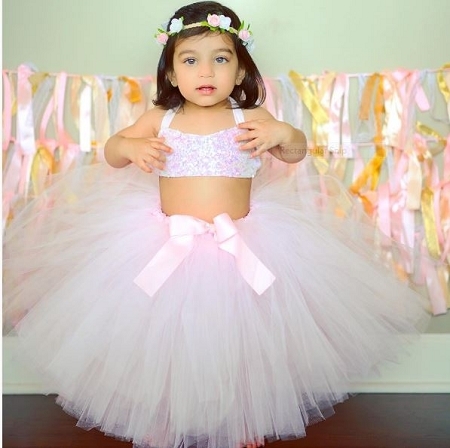 Pretty light pink tutu skirt with pink bow at the waist. Available in other color! Thank you to Piya for sharing this amazing photo of her daughter with us!!! This tutu skirt has a 3/4 inch covered non roll elastic waistband. It is tied and sewn so it won't come apart. Perfect for a birthday party, photo prop, or your special event! The skirt is pictured in size 12m/18m and 14 inch length. Available in 6, 8, 10, 12 and 14 inch lengths! Please select your choice from the drop down menu. Use the suggested sizes or select your choice of size and length!